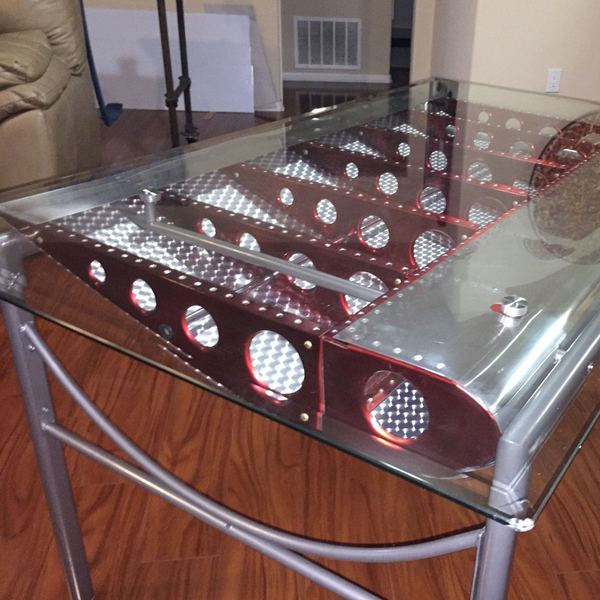 You are looking at a custom made, one of a kind Dining Room or Office Table that is customized with a polished aluminum, candle apple red painted and engine turned aluminum effect surface 1930’s Art Decco Aircraft Wing. The glass top of the table measures 35 inches front to back, and 59 inches side to side and sits at a level of 30″ from the floor. Over 80 hours of hand crafted fabrication went into building the wing, and the table frame is built into and around the wing. It’s a prototype table, built to show the owners of a restaurant which resulted in a massive order for more (but bigger). This one is for sale, and there will be no others like it. The spars are made from 3003 series .032″ thick aluminum, painted candy apple red and clear coated. The leading edge as well as the bottom skin are fully polished 5052 series aircraft aluminum which is .040″ thick with dimple died, counter sing cut 5/32″ flush rivets, numbering around 400 rivets. The interior surface is machine turned effect aluminum and is truly amazing looking, especially in low light and single source lighting situations. The wing it’s self weighs in at around 13 pounds, and the table weight can be found online, it started off as the $200.00 table sold commonly, and it is made by COASTER and is called the Los Feliz, so replacement glass or frame will be easy to find. The cross members on the sides have been lowered from their stock location so the ends of the wing can be seen more clearly. They can be switched from the curved bar looking like a SMILE or like a FROWN, depending on which look you prefer. I prefer local pick up, as it would be very difficult to take apart for shipping. Feel free to ask me any questions, and or check out the other 19 products that I have made under the Nose Art Displays brand name. If you would like something else made, I am happy to entertain your ideas. if it’s made from aluminum and aircraft inspired, I’m happy to build you anything you like! Free Local Pickup – please contact me for other delivery options.